our summer tent ripped on installation and we aren't sure we want to buy a new one....so you get the benefit of us not moving it from the storage building to the antique shop this year. This sale may be for a limited time..so act soon. Look no farther! 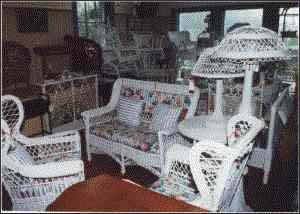 You have found Maine's Largest Antique Wicker Furniture Dealer. 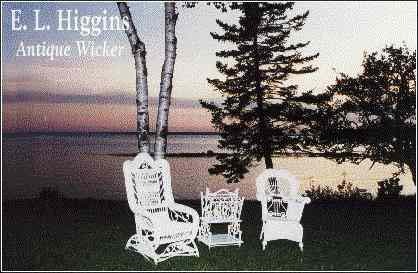 For your largest, most varied, highest quality antique wicker furniture, come to Antique Wicker near Bar Harbor, Maine. 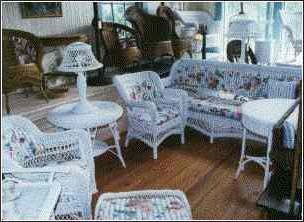 We stock between 400 and 500 pieces of the finest antique wicker furniture. Our items date from the 1860s to the 1940s, and many of them are signed pieces from the largest makers of the periods, such as Heywood Brothers, Wakefield Rattan Company, Heywood/Wakefield Company and Whitney and Reed Company. The pieces we offer our clients are in good to great condition. Some items are in need of paint but offered in that condition as we like to give the client options rather than add unneeded layers of paint. Also many people now want them untouched. We enjoy meeting the perspective owners and helping them put together their spaces. For some people it is a whole room for others it is a one piece per vacation addition. Many items are sold to decorators and designers right from our web site. Located on Mount Desert Island, we can be found off "the beaten path, on the quiet side of the island on route #102. After many years in Bernard we closed that shop and are now located on the web and at 270 Main Street in Southwest Harbor with some of our wicker plus lots of other antiques and collectables. When looking at our antique wicker keep in mind that many pieces can serve dual purposes: Planters can work in a bathroom for towels, with a copper liner they make great bars or ice buckets. Flat top sewing baskets made great end or night tables with hidden storage. They also work in a bathroom by bringing the handle forward for towels and storing items inside and on the lower shelf again have a liner made fill with ice and use to set a dish in that needs to be on ice (lobster tails....you know we are in Maine) Wood baskets are perfect for magazines and newspapers, but don't forget the throw you like to keep handy. What about putting guest items in it and leaving it on the guest bed. Place a love seat in the front hall or pulled up to the table works great. Some footstools also work as tables and extra seating when needed. © 2019 Antique Wicker. All rights reserved.